This bike light is super bright. I think you can compare it with the car’s head light and they have similar brightness. It comes with couple flashing mode. It also comes with head band which you can place the flash light on top of your head without holding it. As for the bike, I attached the battery on the frame of my bike, and it works fine so far. It is not practical when using the head bend because you will be holding the battery or putting it inside the pocket, but there will be a power cable swinging around you which makes it very uncomfortable and inconvenience in a sense. You have to utilize the rubber bend it comes with to secure the light but it is kind of loose on the bike handle, it doesn’t move on its own though. But I would prefer something more secure. There is no power level indication on the battery. Hard to determine the remaining battery life. Not sure what kind of the battery is that, cheap looking. 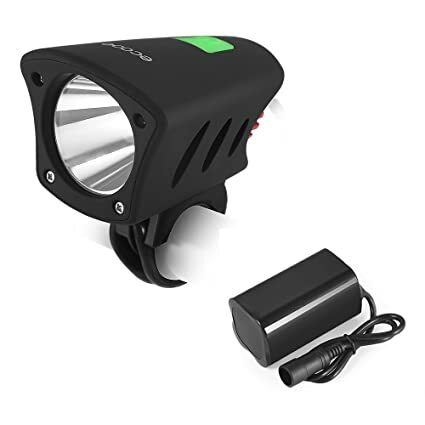 Bottleline: This is a good, bright, and practical flash light for bike and for multiple purposes, but cumbersome.